Atlanta left fans waiting for two days for this “weekend’s” race. We had ourselves a businessman special race. The green flag dropped around 11am and had many rain delays and cautions throughout the lack-luster race. For most fans, myself included, we had to work and missed the beginning of the race where Kasey Kahne had motor problems (been plaguing his ability to win all year), and a few early spins but the majority of the cautions and red flags waved for the elusive Mother Nature. So, was this race worth the wait? 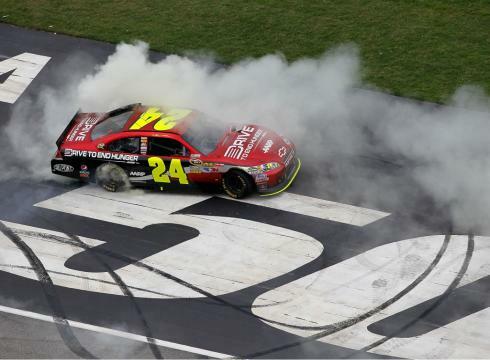 It was for Jeff Gordon, who earned his 85th career win. “Hell yeah! That’s what I’m talking about boys!” an elated Gordon yelled after crossing the finish line .598 second ahead of Johnson. Gordon was strong early, leading 100 of the first 164 laps. And after two brief stops for rain — one that brought a halt to the action for nearly 25 minutes — he slowly worked his way back into the lead on Lap 276, passing Johnson, and then held his advantage through a final round of green-flag pit stops on Lap 284. He had nearly a 2-second lead with 22 laps remaining in the 325-lap race, but Johnson closed the gap and the two battled furiously through the closing moments. Gordon’s win moved him into sole possession of third place in the Sprint Cup Series’ all-time win list, trailing only Richard Petty (200 wins) and David Pearson (105). He had previously been tied with Bobby Allison and Darrell Waltrip. Tony Stewart, Kurt Busch and Carl Edwards completed the top five, with Brad Keselowski, Kevin Harvick, Denny Hamlin, Matt Kenseth and A.J. Allmendinger sixth through 10th. Johnson’s runner-up finish left the five-time champion alone atop the points standings. He entered the race tied with Kyle Busch, who finished 23rd. “I think everybody recognizes how strong they are,” Gordon said of his teammate. “You can never count them out.” Johnson has six top-five finishes among his eight top-10s in the past 10 races. Gordon also has eight top-10s in that stretch, with four top-fives. While Gordon was celebrating another milestone victory, the Chase picture became a bit clearer as Kurt Busch, Ryan Newman and Keselowski clinched spots. Nine drivers have qualified for the Chase. Three spots remain open going into Saturday night’s regular-season finale at Richmond. Who is in and who is out? And is Jeff Gordon the last of his kind? So many unanswered questions going into the last race of the “regular NASCAR season”. Stayed tuned to ESPN and ABC to find out who takes it all and who is only racing for the pride of their team.